Kenko is a Japanese company, whose origin can be traced back to the Kenko products sold by the company Murakami. The company Murakami Shōkai (村上商会) was already in existence in 1928. In 1929, it advertised the It, an inexpensive box camera, which was perhaps the first Japanese camera to use the no-need-darkroom process. In 1941–2, this company was already using the Kenko brand, and was also selling the Semi Kreis 4.5×6 folders; its main address was Tōkyō, Shinbashi, Kōsaten (東京・新橋・交叉点) and the address of the wholesales branch was Tōkyō, Nihonbashi, Honchō 2 (東京・日本橋本町二). In 1949, Murakami Shōkai announced the Kenko 35 camera, taking both 127 film and 35mm film. It was also selling the Kenko reflex housing, which was certainly the first such device made in Japan. The company name became Murakami Shashin Yōhin K.K. (村上写真用品株式会社) at some later time. In 1953, it was still selling Kenko products, and was the distributor of the Union Semi folder and an authorized dealer for the Mamiya and Start cameras; the address was Minato-ku Shibashinbashi (港区芝新橋) 1–16 in Tokyo. In an advertisement dated 1954, the company name was given as Kenkō Shashin Yōhin K.K. (ケンコー写真用品㈱). The main address was almost the same: Minato-ku Shibashinbashi (港区芝新橋) 1–6 in Tokyo, and there was a branch in Osaka. The Kenko products were made by various companies: according to the advertisement, the tripods were made by Eikensha (映研社) of Setagaya (Tokyo) and the filters were made by Tōyō Kōgaku Bōeki K.K. (東洋光学貿易㈱) of Ōmori (Tokyo). For some reason, the Kenko official website gives 1957 as the founding date. The company is currently (2008) called Kenko Co., Ltd. or K.K. Kenkō (株式会社ケンコー). It sells (and perhaps makes) film cameras, digital cameras and camcorders under the Kenko brand, and makes lenses under the Tokina brand. It sells all sorts of camera accessories under the Kenko brand, including tripods, filters, conversion lenses, etc. It also makes accessories sold under other brands, such as the Slik and Daiwa tripods, the Cokin and Lee filters, the Tamrac camera bags, ATP memory cards and Aska portable image viewers. The company absorbed Fujimoto Shashin Kōgyō on December 27, 2007, which has become the Fujimoto photo activities department (藤本写真事業部), making lab systems, enlargers and slide projectors. In 2011 Kenko and Tokina joined forces in Kenko-Tokina. 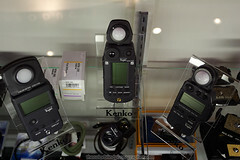 Kenko manufactures meters based on Minoltas designs. ↑ Advertisement in Asahi Camera March 1928, p.A26. ↑ Advertisements by Murakami Shōkai in Asahi Camera May 1929 (p.A37), July 1929 (p.A34), August 1929 (p.A32), September 1929 (p.A32). ↑ Advertisements for the Semi Kreis reproduced in Kokusan kamera no rekishi, p.68. ↑ Advertisement for the Union Semi reproduced in Kokusan kamera no rekishi, p.202. ↑ Advertisement for Kenko products dated 1954, reproduced in Shashin-Bako. ↑ Advertisements in Asahi Camera June 1932 and Shashin Salon January 1934. ↑ Advertisement on p.3 of Nihon Shashin Kōgyō Tsūshin, April 20, 1948, reproduced on p.81 of Hyaku-gō goto jūkai no kiroku. Ars Camera. Advertisement by Murakami Shōkai in February 1949, p.28. Asahi Camera. Advertisements by Murakami Shōkai in March 1928 (p.A26), May 1929 (p.A37), July 1929 (p.A34), August 1929 (p.A32), September 1929 (p.A32), February 1930 (p.A26) and June 1932 (p.A32). Nihon Shashin Kōgyō Tsūshin (日本写真興業通信). Hyaku-gō goto jūkai no kiroku (百号ごと十回の記録, Ten records, every hundred issues). Tokyo: Nihon Shashin Kōgyō Tsūshin Sha (日本写真興業通信社), 1967. No ISBN number. Advertisement on p.81, corresponding to p.3 of the April 20, 1948 issue. This page was last edited on 9 May 2018, at 10:32.